Lincoln’s Inn is located in central London. The main entrance to the estate is manned twenty four hours a day and is located on the south east corner of Lincoln’s Inn Fields. The estate is conveniently located only a short walk from either Holborn or Chancery Lane tube stations. 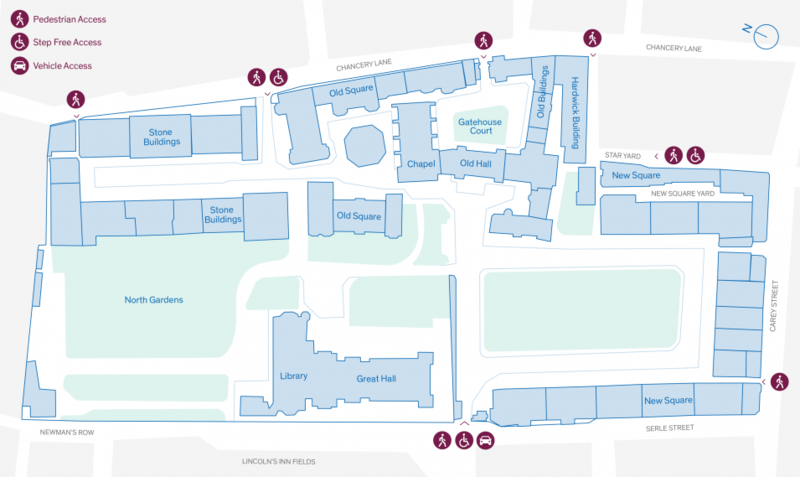 There are also several pedestrian entrances along Chancery Lane which are open to the public between 7am and 7pm Monday to Friday. We aim to provide a friendly, accessible environment for all our visitors and the widest possible access to our buildings. While step free access is available throughout much of the estate, along with all of the Inn’s collegiate buildings, many of the chambers can only be accessed via staircases. Those visiting individuals in chambers are advised to contact the chambers directly regarding access requirements. The Inn does operate a stair climber to assist access. Arrangements for its use should be made prior to arrival with the Chief Porter’s office. They will also be able to arrange, if notified in advance, parking close to the relevant premises. As a private gated estate, the Inn is able to offer secure and safe parking for members and clients. This is with 24 hour security staff and extensive CCTV coverage. Please note: Parking within the Inn on evenings, weekends and Bank Holidays is only permitted for residents and permits holders. Those visiting Lincoln’s Inn on weekdays for any other purpose will be charged for parking. The current rate is £5 per hour or part thereof, which is payable at the main gate on departure. The daily rate is currently £20 per day for registered barristers, residents and tenants. For all other persons the charge is £5 per hour, up to a maximum of £40 per day. Please inform the Chief Porter’s office at least 24 hours prior if you are attending an event and wish to drive to the Inn. Taxis and private cars are not charged for dropping passengers off; there is a 15 minute, no charge allowance for this purpose. Members, tenants, and residents of the Inn are entitled to purchase annual permits for parking in the Inn. Any enquiries and applications for permits should be made to the Chief Porter or Deputy Chief Porter, who will provide information on current rates. We accept all methods of payment except American Express. Visitors are welcome to walk around the precincts of the Inn, which are open Monday to Friday 7 am to 7 pm. The Inn’s buildings, however, are only open for organised tours, except for the Chapel which is open Monday to Friday 9 am to 5 pm. 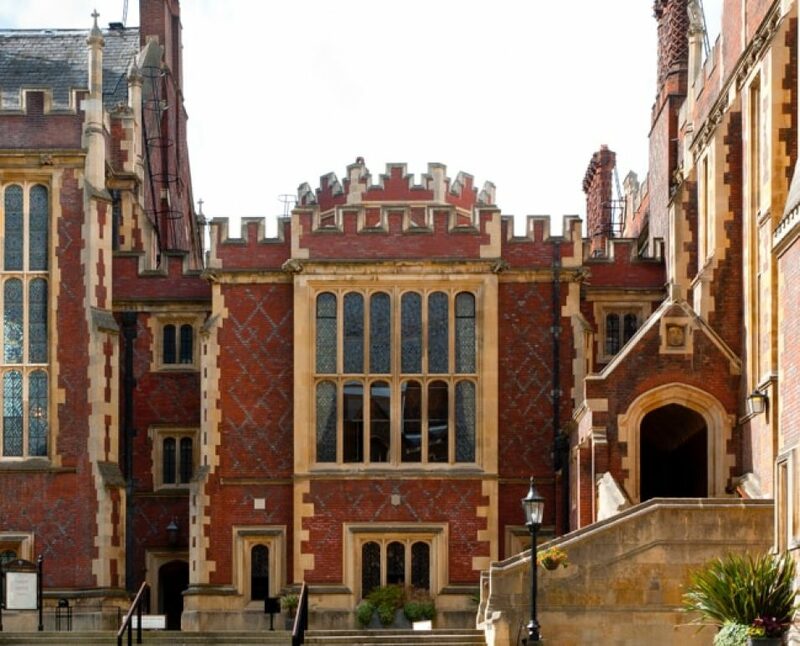 The estate of Lincoln’s Inn is currently undergoing its biggest set of changes for well over a century. Major works to the Great Hall, the Library and the East Terrace unfortunately mean that tours cannot take place between May 2016 and October 2019. However, prospective members and university groups who are interested in having a tour of the Inn can contact our Outreach Coordinator, Andrew Smith.